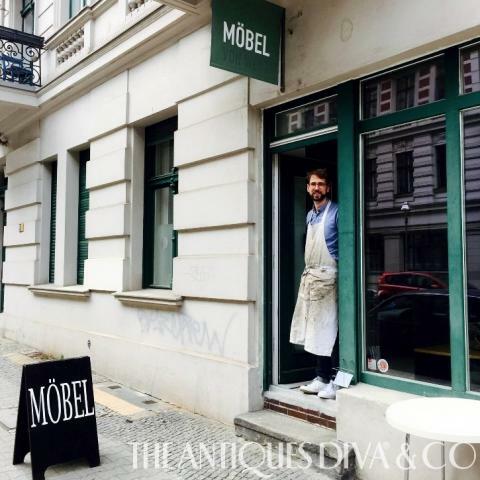 While my home is in Berlin, I’m the first to admit that this city isn’t booming with fabulous antique stores. The flea markets are fun to shop, and it’s true that you can unearth some gems at great prices—vintage furs are definitely a favorite among clients shopping in Berlin. But when it comes to true antique showrooms and stores, there just aren’t an over abundance of them in Berlin. However, my Office Manager Barbara recently suggested that we check out an antiques shop in Kreuzberg that she had fallen in love with so I set up a business lunch with Barbara and our Creative Consultant Andrew at a cute little Mediterranean restaurant. After our meeting, the three of us walked a few blocks, popping into a few small shops. As we meandered through various tiny rooms packed with shelves of bric-a-brac, I wondered if the shop Barbara was taking us to would be any different. Once we reached our destination, Felix Bachmann Antiquitäten, I instantly knew that we were in for a treat! This store was unlike any that I’d seen in Berlin! The first room upon entering housed antiques and vintage pieces that reflected a style—not a specific time period, but rather a point of view. Pieces of differing provenance and age mixed together like guests invited to a dinner party. A mid-century chandelier hung over a 19th century table surrounded by industrial chairs, with a modern art piece—which we later learned was the work of Felix Bachmann himself— hung on the wall. I couldn’t wait to wander through the rest of the space and meet the mind behind these well-curated rooms. Passing through to the next room, we were met by a young man coming in from the inner courtyard. Wearing a work apron covered in markings that can only be acquired by actual hard work, he introduced himself as Felix, the owner of the store. I was so interested to learn that he’s been working in the antiques industry for over 10 years (given he had to be under 30 I was so impressed with this Antiques Young Gun!) He specializes in restoring furniture, which he does in his workshop just steps away. By looking at and touching the pieces in his shop, you can tell that he is highly skilled at gentle restoration and takes great pride in retaining the integrity of each piece. We learn that he avoids using machinery as much as he can in the restoration process, opting rather to do things in the traditional way—by hand and with old varnishes, glues, and color formulations. As we looked around the shop, I was particularly struck by an aluminum piece of a plane wing. It made a fantastic statement in the shop and I could picture it in a home as art. There was also a pair of leather chairs by Mario Bellini that were gorgeous. The overall look of the store could work in a traditional country house or a loft in the city. That’s what makes this shop so special. Felix’s taste is globally influenced which is partially inspired by internships he’s done in Germany, England, Italy, and New York. I cannot wait to see his effect on the Berlin antique scene. I have a feeling we are going to see great things from him and from Berlin in general with Felix at the head of the pack. Bravo Felix! Delighted to have met you!